On July 7th, Community’s longest serving employee, Maryann Bovio retired. Bovio worked at Community for over 50 years, and was involved with many bank operations. Bovio started with Community by assisting in the mail room while still in high school and finished her career as Vice President and Supervisor of New Accounts. She will be missed by employees and customers alike. “I’ve enjoyed knowing so many customers over the years. I found working with customers who span three generations of the same family a very nice part of the job. Community has been a great bank to work for. I guess my 50 years here makes that point,” said Bovio. Dane Cleven, president and chairman of community said “Maryann has been a most valued member of the bank’s management team. She established wonderful relationships with hundreds of customers. She knew many by name and they knew and trusted her. We thank Maryann for her 50+ years of dedicated service to our customers and wish her well in retirement.” Community Savings Bank is a member of the FDIC and is an equal housing lender. The bank is located at 4801 W. Belmont Avenue, Chicago 60641. Telephone: 773-685-5300. You can also visit their website, communitysavingsbank.bank. Caption for photo: Maryann Bovio retires after over 50 years with Community Savings Bank. 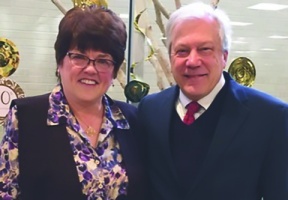 Mrs. Bovio is pictured with Dane H. Cleven, President and Chairman of the bank.